In addition to the color ring projects for SOVON, I am ringing while no color rings are used at all. Next, information about influenza research in Ducks in city parks, transmitter research in Buzzards, Corn Crakes, Little Owls, White Storks and Black Grouse. Ringed Wild Duck male, Arnhem 6090545, Feb 14th 2008 Lorentzweg Hilversum. Shot on May 6th 2008 Verkola, Arkhangelsk O., Russia. This is 2659 km from the ringing site! Ringed Gadwall male, Arnhem 5229289, Dec 3th 2008 Hazelaarlaan Hilversum. Shot on April 12th 2009 Abramovka, Moscow O., Russia. This is 2241 km from the ringing site! 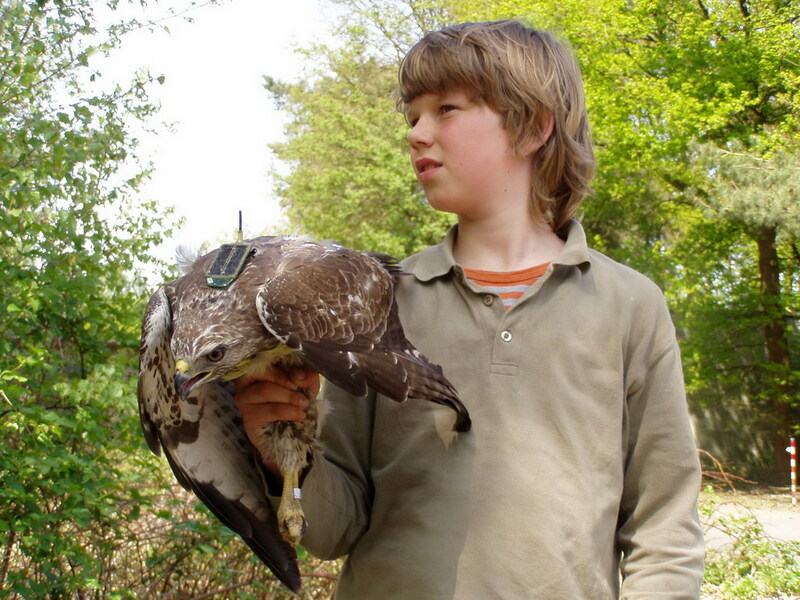 At the airfield Eindhoven six Common Buzzards were equipped with an electronic tag for the Royal Airforce and the University of Amsterdam in May and June 2010. 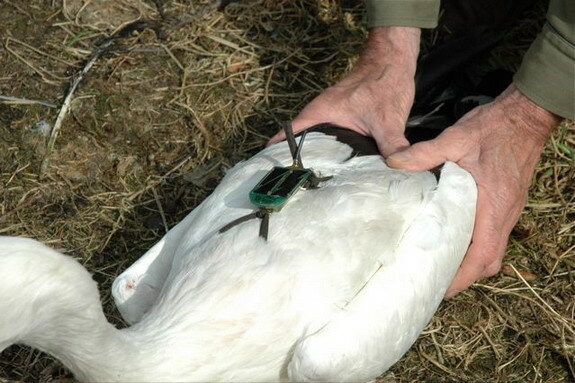 The electronic tags used are comparable to the electronic tags used for the White Storks. The equipped Common Buzzards are all marked with yellow paint on the wing(s) and or the breast. From the 'pattern' you can see which Common Buzzard is which. The intention of this electronic tag project is to map the local flying movements of the Common Buzzard at and around the airfield as precisely as possible. By knowing more about the flying movements, then collisions of birds with airplanes can be reduced even further in the future. 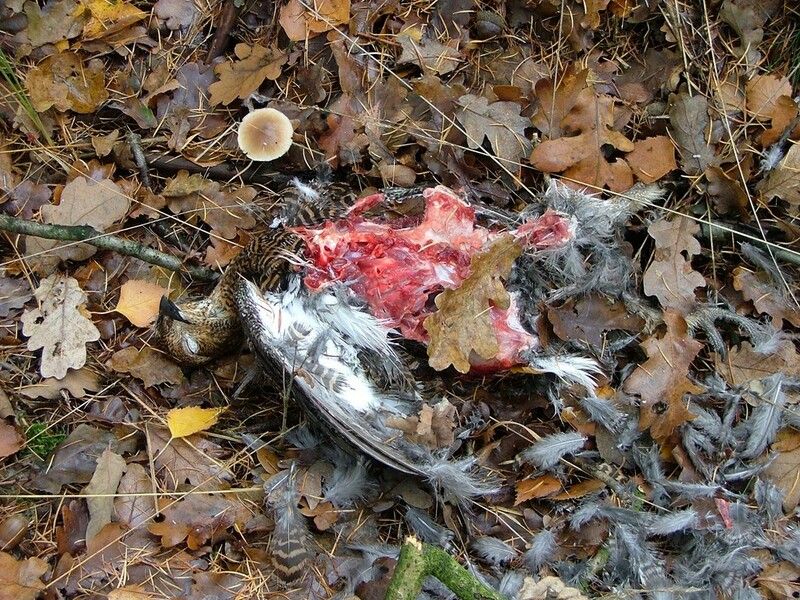 Another Common Buzzard (purple in the picture) has received an electronic tag on May 16th 2010. Next, we did not hear anything from him until June 10th, 2010. And when you see the picture below, you will also understand why! This Common Buzzard started a journey towards Belgium and France on May 17th. Near Rouen he started his journey back to The Netherlands around May 21st. On his way back he has been in the vicinity of Eindhoven, but not on the airfield. Apparently he wasn't quite done and flew towards Germany (has been in Osnabrück!) in order to return to the airfield on June 7th! Who would consider that Common Buzzards cover such enormous distances within the breeding season?! In these cases it is very likely that these are 2nd year Common Buzzards without a nest. 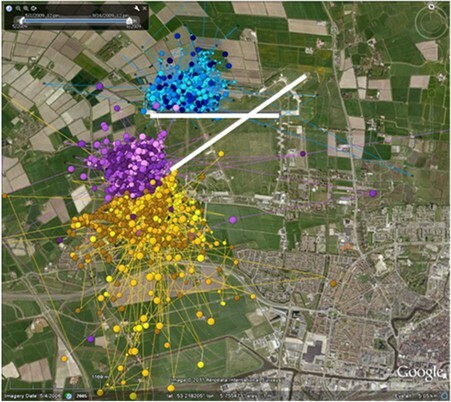 These are completely different results as opposed to the airfield Leeuwarden where in 2009 five Common Buzzards have been equipped with an electronic tag. 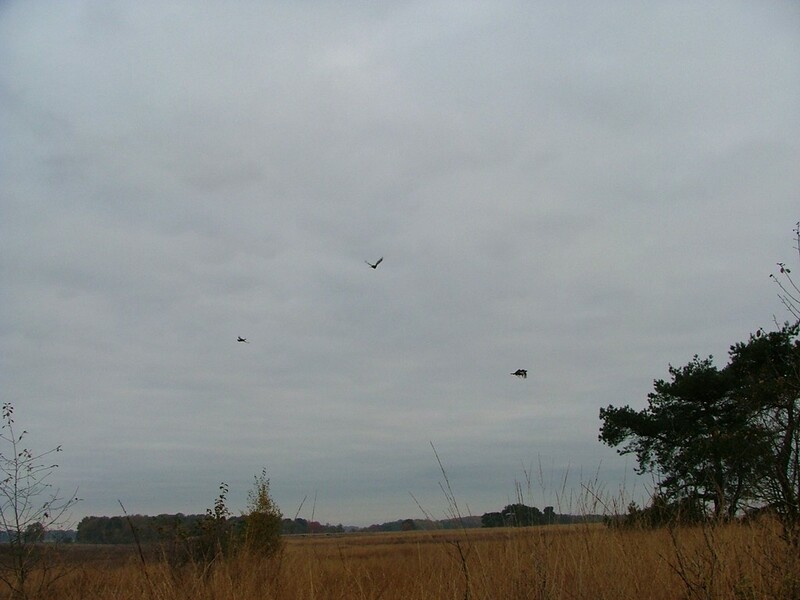 These Common Buzzards did have a very small territory around their nests. 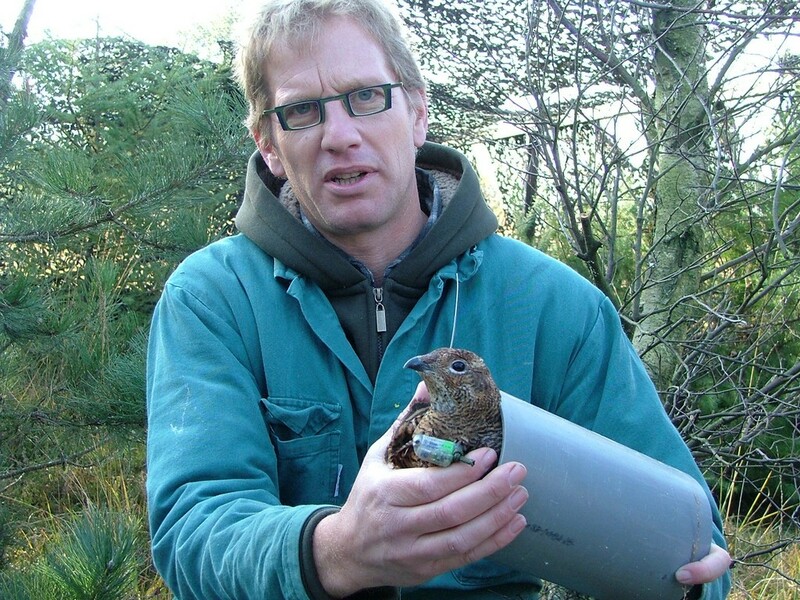 In 2007 and 2008 I have caught a few dozen Corn Crakes and added a transmitter. The results from 2007 can be read in the SOVON article Kwartelkoningen in de peiling. 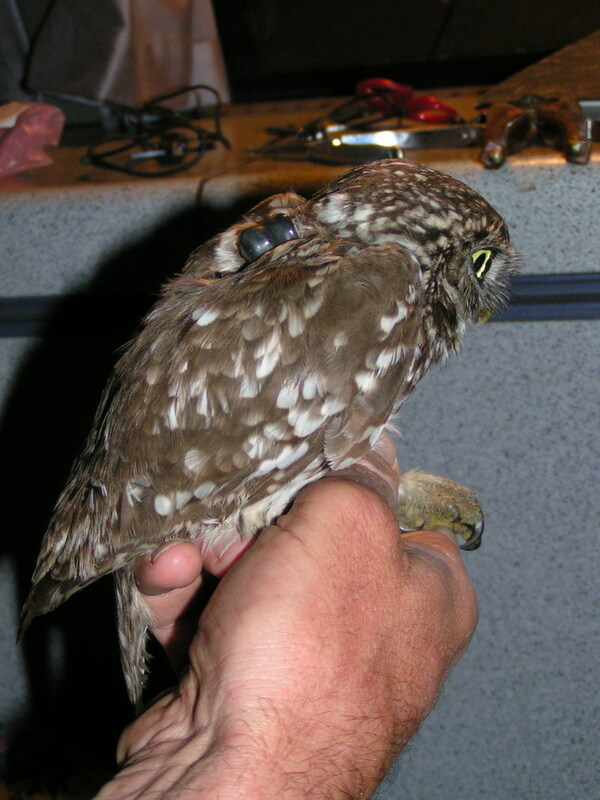 In 2008 I have captured three pairs of Little Owls and equipped them with a transmitter in order to study habitat usage and food choice. The summary of the results from this study can be read in the accompanying pdf document in bijgaande pdf document ‘Terreingebruik en voedselkeus van broedende Steenuilen in de Achterhoek’ te lezen. In 2009 I have equipped three White Storks with a transmitter. With this transmitter, the foraging area of the White Storks is mapped very precisely. From the beginning of April until the young fledged around half of July during the day on average every two minutes it is logged where they obtained food. Using the data, an attempt will be made to improve the local environment, then the supplemental feeding of the White Storks in the project can be reduced further. The project is based on collaboration between the University of Amsterdam, SOVON and Vogelbescherming. The transmitter was developed by the University of Amsterdam (www.science.uva.nl/ibed-cge) and SOVON has done the fieldwork. Vogelbescherming has provided funding for the project, and will coordinate the improvement of the local environment. The transmitter is a GPS system. Thus, a miniature GPS-backpack of 18 grams with a solar panel, battery loader and battery, a GPS-receiver and antenna, a processor and memory, a sensor to measure frequency of wing movement and a radio transmitter and receiver. The number one advantage of this system is that data can be sampled very frequently in order to know in what way White Storks use the landscape (in meters). A disadvantage is that the communcation runs through a ground station. Thus, that the White Stork needs to be close the ground station and return there in order to read the data. 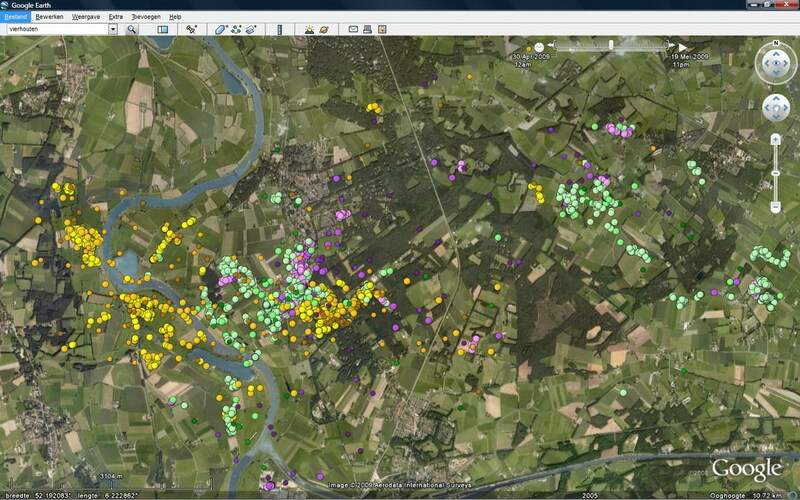 When the White Storks migrate, we can read the data from their fixed nestsite next year, when they return next spring. The White Storks have been caught with a walk-in cage. When a White Stork was used to feeding in the cage, we tried to catch it. That however, was more difficult than it seems ... we had to catch non-fed wild White Storks. 1) The first White Stork was caught on April 11th, 2009. Arnhem 4431, black colour ring 100 was added. This is a male, ringed on June 21st 1999, as a nestling in Zegsveld. A grand total of 49,500 mesurements were collected from this White Stork. 2) The second White Stork is caught on April 22nd, 2009. Paris P8797 with colour ring white AEPT. A male born in 2006 in France ! And irrespective of the fact that this bird carried a colour ring for years, this is the first report of this bird. Only 13,500 measurements were made from this bird. This was due to the fact that he did not breed and from June 2nd he did not return within the area of the ground station. 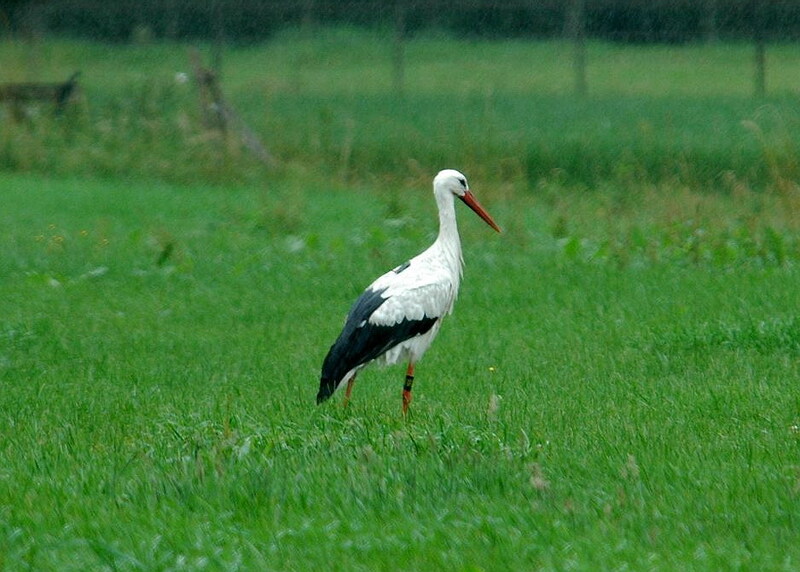 3) The last White Stork was caught on May 16th 2009. Arnhem 5764, I added black colour ring 101. Probably a female, ringed on June 1st 2002 as a nest young in Gorssel. A total of 25,000 measurements were made from this bird. In the map below, the results are shown in the period of transmissions until May 20th. The first White Stork in yellow, the second in green, and the third in purple. The faster the bird moves, the darker the colour of the sphere. Thus, the bird is flying for most of the dark spheres and it is foraging for the light spheres. Later in the season the White Storks travelled further from the nest in order to find food for their young. These data still need to be processed further. The goal was to equip 6 White Storks with a transmitter. This was not accomplished, for a number of reasons. But a lot more data than expected have been generated for three of the birds. This is especially due to the fact that the weather in April and May was very sunny and therfore the solar cell could charge the battery and thus the number of measurements per bird could be expanded. For more information on White Storks please see here. After many years of preparation Brabants landschap has re-introduced the Black Grouse on the Regte Heide, South of Tilburg. 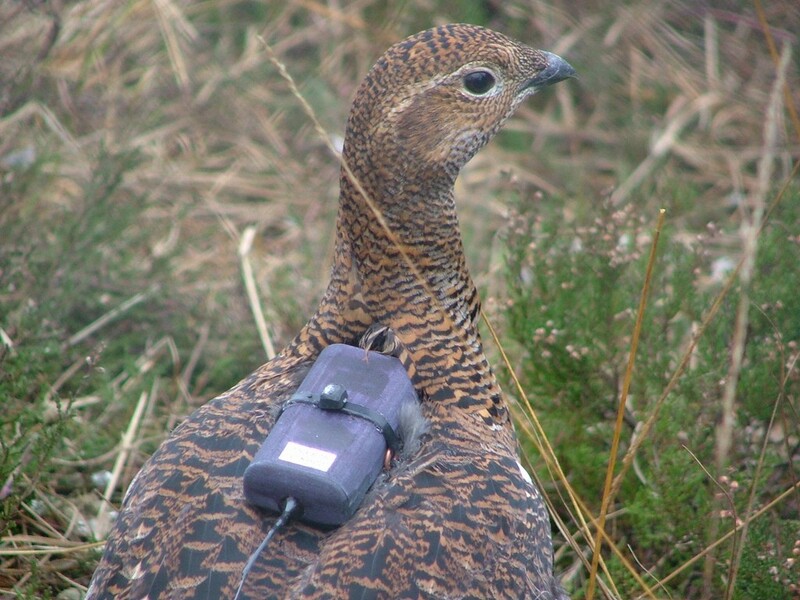 Under supervision of SOVON, I have given an electronic tag to more than half of the re-introduced Black Grouse's. 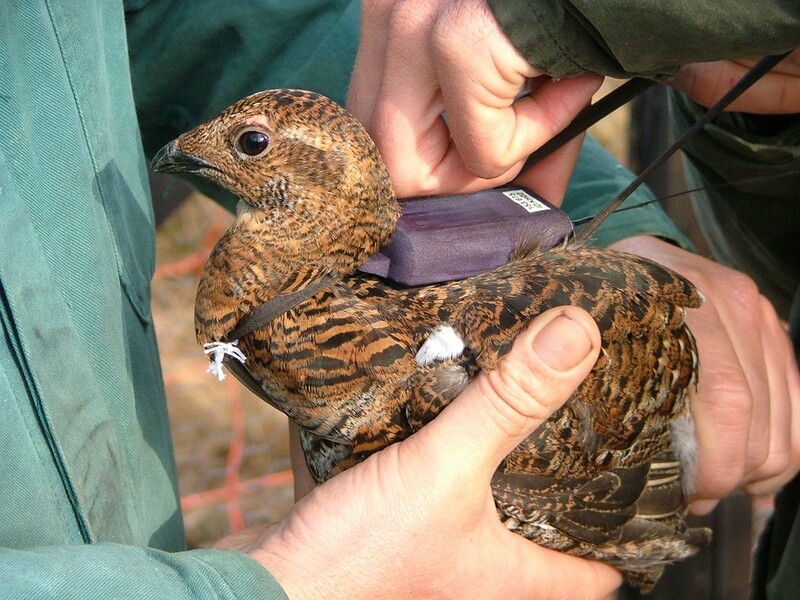 Of 43 re-introduced birds, 24 obtained a radio transmitter and two birds got a GPS-transmitter in the shape of a back-pack. The latter where at the upper end of the acceptable limit (maximally 5% of the body weight). 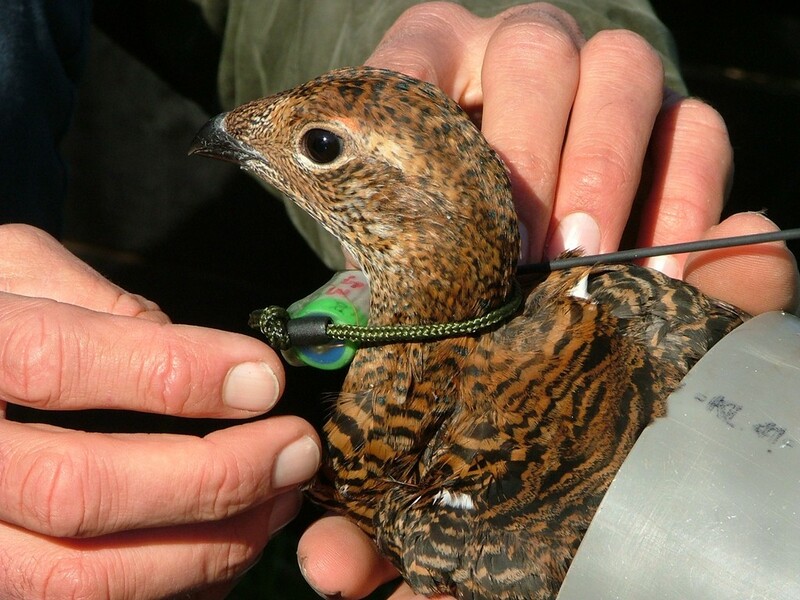 I have tested these extensively on a male Black Grouse in captivity and on my chicken (of the same size). 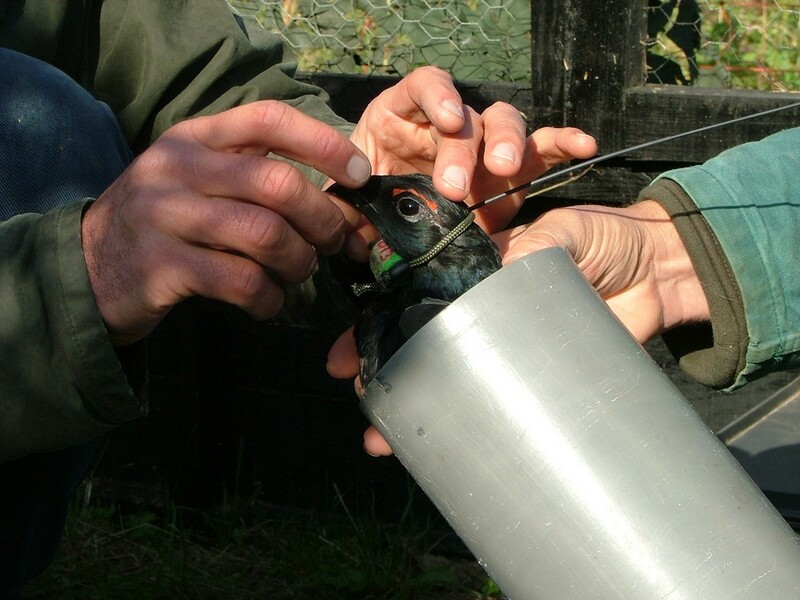 The two birds which were re-introduced with a back-pack, have been observed in a cage order to get used to the environment so that they can survive more easily. When it was clear that both birds did not have any problems with the back-pack, they were introduced outside. 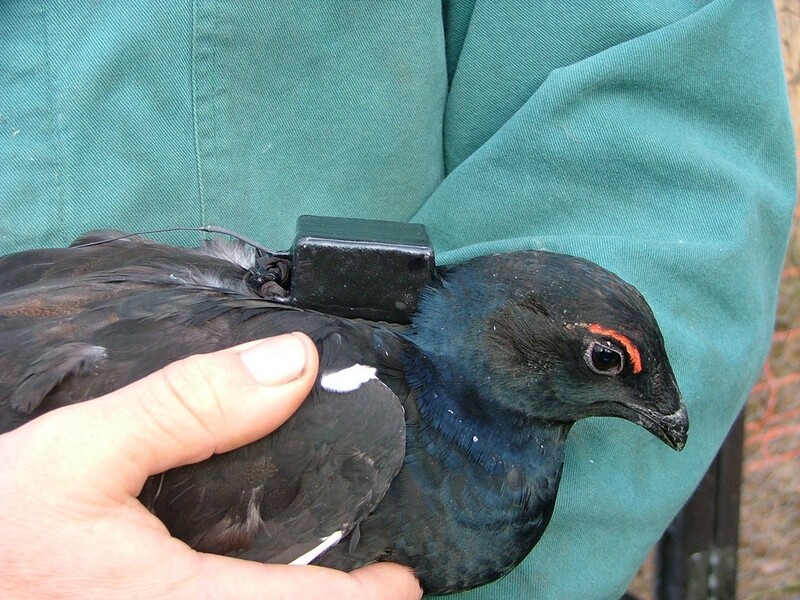 After re-introducing the Black Grouse, the birds with a transmitter where followed intensively by Pieter Wouters. 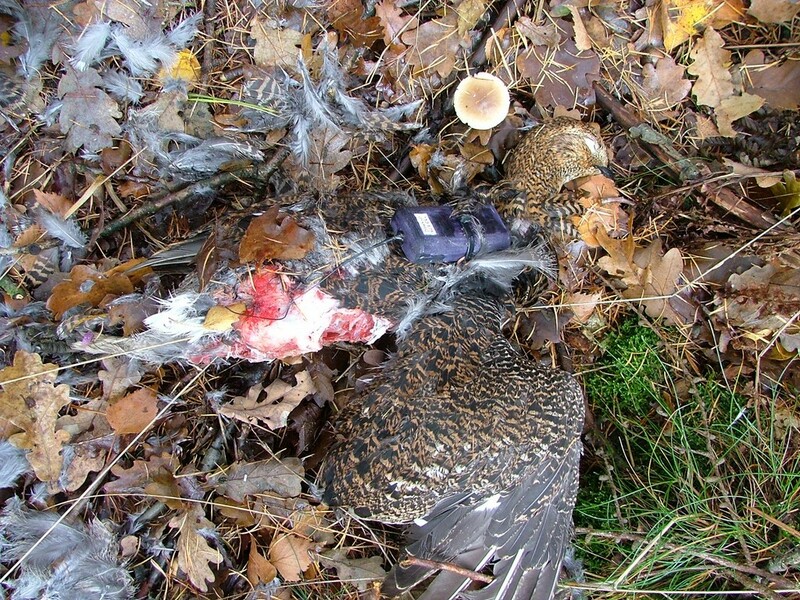 Unfortunately, all 26 Black Grouse's with an electronic tag (and some of the Black Grouse's without an electronic tag) where found dead within a couple of weeks. Most of them were caught by a Northern Goshawk. The plan was that this was the first of a series of years of re-introductions... in spite of many changes which were made in the environment. First, we have to reconsider and hopefully a different plan may succeed next year. See here a article from magazine De Takkeling 18 (2), 2010: Het Korhoen, de Havik en Staatsbosbeheer (auteurs: Rob G. Bijlsma & Eef Jansen).